The FOCSA Building was built from 1954 to 1956. Named after the contracting company Fomento de Obras y Construcciones, Sociedad Anónima, it is 121 metres (394 feet) tall and located in the Vedado section of Havana. The structural engineer was Luis Sáenz Duplace, professor of engineering at the University of Havana and of the firm Sáenz, Cancio & Martín. The architects were Ernesto Gómez Sampera (1921–2004) and Martín Domínguez Esteban (1897-1970) who designed the Radiocentro CMQ Building. The civil engineers were Bartolome Bestard and Manuel Padron. Gustavo Becquer and Fernando H.Meneses were the mechanical and electrical engineers respectively. Main elevation from 13th floor showing bearing walls. The building is located on a site bordered by Calles 17 and M and Calles 19 and N in el Vedado. In 1952 the CMQ Radio and TV Network located at Calle Rampa and M in el Vedado planned to provide administrative offices, a radio station and housing for employees. CMQ selected a 110,000 sq. ft. plot of land costing approximately 700,000 pesos. The company Fomento de Hipotecas Aseguradas (FHA) financed 80% of the cost of the residences and 60% of the commercial shops. El Banco Continental Cubano granted a credit of 6 million pesos. Work began in February 1954 and finished in June 1956. At the time of construction it was the second largest residential concrete building in the world, second only to the Martinelli Building in São Paulo, Brazil. It surpassed the López Serrano Building in height which had been Cuba's tallest building. In the early 1960s middle-class owners of residential floor units had their properties nationalized by the current government. In the 1970s the building housed Soviet and Eastern bloc specialists and advisors and the ground store supermarket was for non-Cubans only. In 2000 an elevator cable snapped killing one person. In the 2000s the building was repainted and renovated and much of the building was given over to temporary housing of foreign guest workers, primarily from Venezuela. 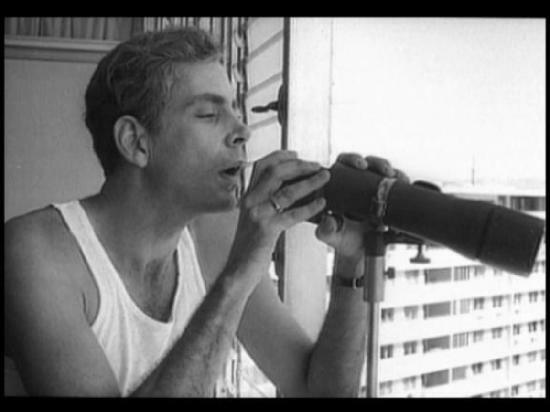 A penthouse in the FOCSA was used as the apartment of the protagonist Sergio Carmona Mendoyo, played by Sergio Corrieri, in the film Memories of Underdevelopment, a 1968 film written and directed by Tomás Gutiérrez Alea. Tenant corridor. Showing center bearing wall, entrance to center apartments F and G on 14th and 15th floors. Original signage. Additional concrete massing at the center of the Y, apartments F and G, help resist lateral forces. The walls extend through the rear wall to support the corridors. The wall and slab structural system form a three dimensional lattice resisting horizontal forces. A high strength concrete mix from 3,000 to 7,000 psi. was used. The tower and corridors show prefabricated panels on the exterior. Reinforced concrete columns support the podium and the stories below. The residential block, the 'Y,' is supported by thirteen eleven inch walls. The building was chosen in February 1997 by the Unión Nacional de Arquitectos e Ingenieros de la Construcción de Cuba (UNAICC) as one of the seven wonders of Cuban civil engineering. The FOCSA has 39 floors 4 of which are dedicated to commercial use, two floors are for parking. Twenty eight floors have thirteen residences each. The thirty fourth floor has six penthouses on a plinth made possible by the structural walls which stop below this floor. Each penthouse is the size of two apartments (A+B, C+D, E+F, etc.). The penthouses have a dedicated elevator and patio-courtyards open to the sky. All apartment floors are terrazzo on cinders. Apartments are one half level up or down from the corridors. A typical floor contains 13 apartments, five have two bedrooms and a maid's room. The cost of the apartments was $21,500 for the larger units in the center and $17,500 for the smaller ones. It was stipulated that an additional $30 per each floor was charged the higher up in the building the unit was located, the highest apartments were the first to be were sold. Located in the tower, are the building's four tenant and two service elevators and two sets of stairs. One of the service elevators is dedicated for the restaurant and the observation floor. The other service elevator is for the apartments and is linked to the service corridors. The tower also contains offices on the 37th floor for the restaurant, “La Torre,” on the 38th floor and an observation room on the 39th floor. Typical floor plan. Stairs from tenant corridor. Service stairs shown below. Entrance to an apartment half a floor down from tenant corridor. Apartments located one half floor up or down from corridors. Tenant elevator lobby, tower apartment stairs. Typical apartment showing service and tenant stairs to two different corridors. The podium contains a clubhouse, offices and swimming pools for adults and children. It has gardens, lighted paths and benches. There is a ramp to the street located at the corner of 19th and M, the podium was used as a staging area during the construction of the project. Below the podium at the fourth level are building offices. Calles M and 17, FOCSA building entrance. Marked by a two lane covered porte-cochѐre at street level is the building's entrance. Inside is the building desk, a large waiting area and the tenant elevator lobby. The restaurant “El Emperador” and a supermarket a bank, post office, theaters and two radio stations are also on the ground floor. (COCO and Radio Metropolitana) Various cafes situated around the perimeter of the site along a double loaded corridor traversing the site from Calle M to N. Light filters to the interior corridor from openings in the podium. At the second floor (green in section diagram) are the administrative offices for the building. The wall extend through the rear wall to support the corridors on the outside of the building. They are separated (vertically) by twenty inches to provide a continuous space for apartment ventilation and views= to the west. There are three sets of service and tenant corridors every other floor. The center corridor is for service the other two longer corridors are for tenants. The service and tenant corridors are unrecognizable from the exterior, except that the service corridors are shorter in length, this reflects the location of the service stairs of the end units, A and L. Service and tenant corridors are located at different heights. From each apartment the exit stair goes up to the tenant corridor and down to the service corridor. There was initially a private elevator to each apartment (X on plan), which were never installed. Section at tenant stairs & service corridor. Rear elevation showing floating corridors. Tenant (blue) & service (red) stairs from apartments to corridors. Interior of service corridor looking north. The FOCSA offers a new typology in residential single loaded corridor design with its twenty-inch separation between corridors allowing for cross ventilation of the apartments and views to the opposite side of the corridors. There is a dropped ceiling over the bathrooms and maid's room that allows for natural ventilation to flow through the apartment. Closet doors have vent grilles on their tops and bottoms to allow for air circulation. Curiously, the kitchen window is located horizontally in the center of the wall under the cabinets similar to Edificio del Seguro Médico by Antoni Quintana. Twenty inch separation between corridors showing apartment windows. Separation of corridors for ventilation and views. ^ a b c d e f g h Fox, Arthur. “Concrete Apartment House 39 Stories High.” Engineering News Record 7/1955:34-37. Print. ^ a b "El edificio Focsa y sus orígenes". Retrieved 2018-07-15. ^ "Radio Metropolitana". Retrieved 2018-09-06. Roof showing penthouse courtyard openings. Tower exterior showing prefabricated concrete panels and change in level. Rear service stairs to tower apartments. Service floor. Service elevators & stairs to tower apartments. Tower detail showing north corner windows, prefabricated concrete panels and change in level. Apartment up to tenant corridor, window below between corridors. Window between corridors in stair down from apartment to service corridor. Window between corridors at tenant stair. This page was last edited on 29 December 2018, at 15:10 (UTC).